SANTA FE, Texas — A student who was killed in this month’s massacre at Santa Fe High School in Texas gave up his own life to save others, his pastor said during the student’s funeral on Friday. According to reports, when 17-year-old Dimitrios Pagourtzis began shooting in the hallway near the art room on May 18, students in Garcia’s class ran for the back door, but found it to be locked. They also tried breaking the windows, but were unsuccessful. As an adjacent art room was connected by a supply closet, students then ran into the closet and went through to the other room to get away from the gunfire. Among those Garcia helped were his best friend, Courtney Marshall, and the substitute art teacher for that day, Ann Perkins, as he hurried them both into the closet. He then closed the door and held it shut so as to keep the gunman from entering and harming any students on that side. Some students were reportedly able to escape out of the building because of his bravery in staving off the gunman. Pagourtzis soon shot at the closet door, killing Garcia. When the door opened, Marshall and Perkins noticed that Pagourtzis was reloading, so they bolted. Marshall was able to make it to safety, but Perkins was fatally wounded. Garcia’s pastor reiterated the account to those who gathered to remember his life on Friday. 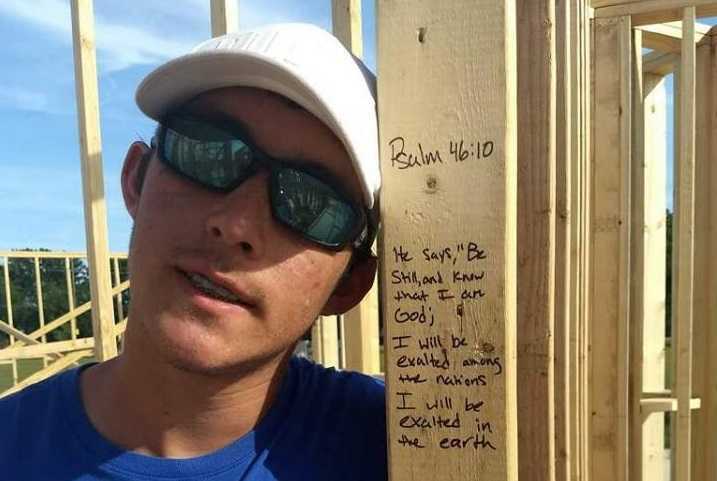 Garcia had just had his photo taken days prior as he had written Psalm 46:10 on a wooden door frame at the site where his family was building a new house. Garcia had reportedly been reading Scripture with his mother the night before the tragedy, and wanted to join the U.S. military.